Dolly waited impatiently at the phonebooth. She had seen him, Herbet that is, walk into the drug store some twenty minutes ago and not yet come out. Her plan was sound, but boy was she getting sick of waiting, standing there in her too-small white pumps. But it was well worth it of course, she reminded herself... "Excuse me, but I seem not to have a single coin in my purse to telephone my ill grandmother... would you be SO kind?"... Lots of lash flutter and sweet demureness and he would be helpless. Foolproof. What a lovely sunny winter afternoon for a photoshoot, in Clunes with my talented photographer (and gorgeous friend) Nette. I am loving the colour combo of powder blue, cherry red and white or creams at the moment. 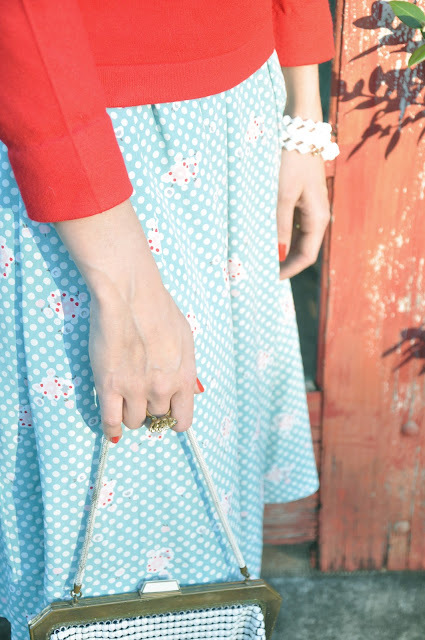 This sweet little polka dot dress can be found here, Oroton mesh clutch here, and little red wool jumper here. Team your vintage threads with some cherry nail polish and lippy and you're ready to loiter by the phonebooth!